Re-cap: Entangled is the story of a rocker girl named Cade who thinks she's alone in the universe until she discovers that she is atomically entangled with another human on the other end of the universe, and in order to save him she has to go way, way out of her comfort zone and travel with a band of smugglers to get to him. Before you ask, no, she's not in love with him. That'd be far too easy. 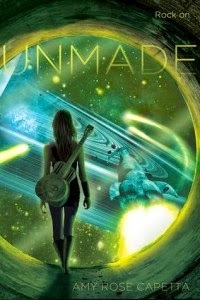 Unmade picks up where Entangled left off, with Cade determined to find her mother using her talent for hearing other people's songs. Unfortunately, the nasty Unmakers aren't too keen on humanity surviving much longer, and the universe becomes very dangerous for humans. Cade, Renna & Rennik, Lee, Ayumi, Gori, and newcomer Mira team up to execute a daring plan to save what's left of the human race--and find a new home for them all before they succumb to space-sickness. I loved Entangled because it rang with the charm and strangeness of Firefly, but I adore Unmade because it thrums with the danger and urgency of Battlestar Galactica. (Hey-o, nerd alert!) Everything about this book is fast, adventurous, and dangerous, and the stakes couldn't be higher. But while our beloved characters are saving the universe, they're also dealing with shifting relationships, falling in love, learning how to trust one another, grieving and celebrating, and figuring out what's right. The quiet moments of connection are just as breathtaking as the action sequences, and that's what makes this novel stand out. Because I know what you're wondering--yes, Unmade is even swoonier than Entangled! We don't just have one couple, but TWO to sigh over. I love Cade and Rennik. I love Lee and Ayumi. I love all the kissing (and more) that's in this book. It's not inappropriate or gratuitous. It's just RIGHT. My final verdict: Unmade is worth the read. It's worth re-reading. (I read it twice!) It's worth buying. It's worth buying in hardcover. It's a very shiny book, and I mean that in more ways than one. Book purchased at my local indie, which just so happens to sell signed (and personalized) copies of Entangled and Unmade! Wow. Is this book out now or about to debut? So excited for Amy Rose! I've just chanced upon your blog [and been reading older entries for almost 5 hours now :3] and I must say that I want to read most of the books you've already posted about here. I really hope you keep doing the good job you've been doing here!